After news reports of debts following Robin Williams' tragic suicide in August last year, it is so sad to hear that his widow Susan Schneider and his three children - Zelda, Zack and Cody - from previous marriages are now in a fight over property left in his will. 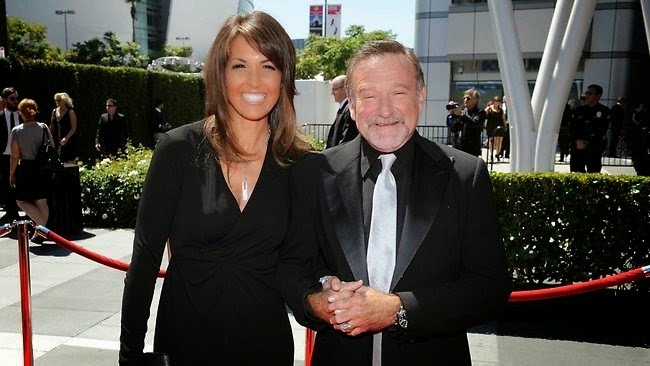 Susan Schneider reportedly filed legal documents complaining someone entered the house she shared with Robin Williams days after his death and removed belongings that she felt entitled to. She is also said to have revealed that once she started legal proceedings, 'certain home-related services were canceled' including a newspaper delivery. The New York Times have reported that the court documents were filed in December and January in a bitter legal dispute over his estate. However, TMZ report that his children Zak, 31, Zelda, 25, and Cody Williams, 22, tell a different story and have accused Schneider of attempting to 'money grab' and ignore the 'plain language of his will and trust'. Sources tell the site that his children believe Schneider is trying to 'redefine' aspects of the will to suit her, despite Williams being clear in his will that he left behind most of his property to his children. Susan -- who was only married to Robin for 3 years -- acknowledges she has no right to items related to his acting career, such as his suspenders from "Mork and Mindy," but she wants other items like the tux from his wedding and other "knickknacks." Sources connected with the children say Susan can absolutely keep the items she accumulated with Robin while they were married, but they say she has gone way further. For example, they're indignant she is apparently trying to redefine the word "jewelry." We're told the kids are supposed to get all of it, but she's saying "jewelry" does not include his watch collection. Some of the items left to the three children include his 1998 Oscar for the movie Good Will Hunting as well as other memorabilia from his films, action figures, graphic novels, theater masks and other items to his 3 children.